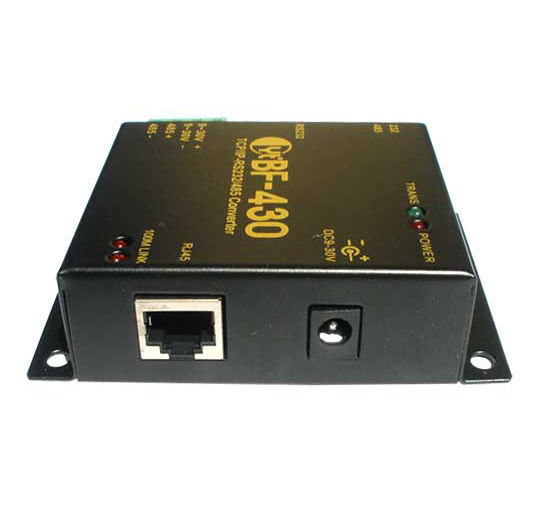 This serial RS232 to Ethernet converter is similar to our XS1000 serial to Ethernet converter, the main difference between the two is that this converter has a faster and better processor and also has more advanced features than the XS1000. This makes this serial RS232 to Ethernet converter ideal for more complex setups and configurations. You can for example use this converter in 'Tunneling mode over LAN' where you communicate between two serial devices over a Ethernet network via two serial RS232 Ethernet converters without using a computer. 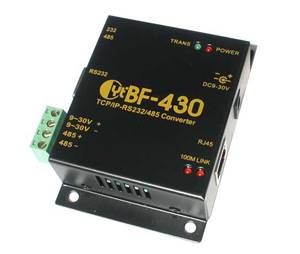 Just like our other RS232 to Ethernet converters this converter will allow you to communicate with a remote RS232 or RS485 serial device over an Ethernet network. Once the included virtual COM software has been installed a virtual COM port will show up in your operating system's Device Manager. This virtual COM port can be accessed via your application software and used almost as if it was a standard built-in local COM port. The port has many settings which can be adjusted such as baud rate, parity rate, stop bits, Real COM mode, forced packed time and length, flow control and many more parameters are available. Even this serial RS232 Ethernet converter has many advanced settings and parameters it is still easy to setup and very user friendly. In many cases you will not even need to adjust the settings, unless your serial device needs specific settings the default parameters will work right out of the box. The parameters can be configured through any web browser or the included virtual COM driver software. 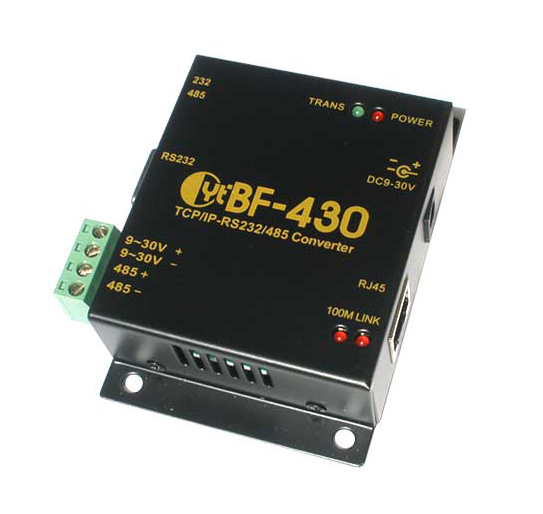 The converter has one RS232 port with a standard DB9 connector and one RS485 port with a detachable screw terminal header for easy connection of individual wires. LED lights for TX/RX helps identifying when data is sent and received. The converter can be powered by an external 9V power supply through the DC power connector or by applying power to the 9V screw terminals. 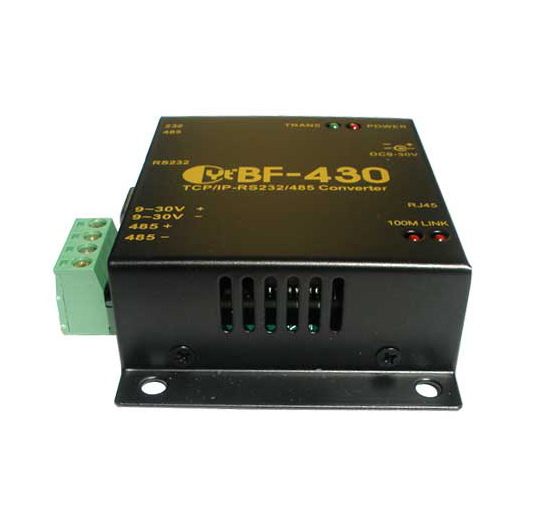 The BF430 can be used either in a local Ethernet network but it can also be setup so it can be accessed over the Internet by using a VPN. 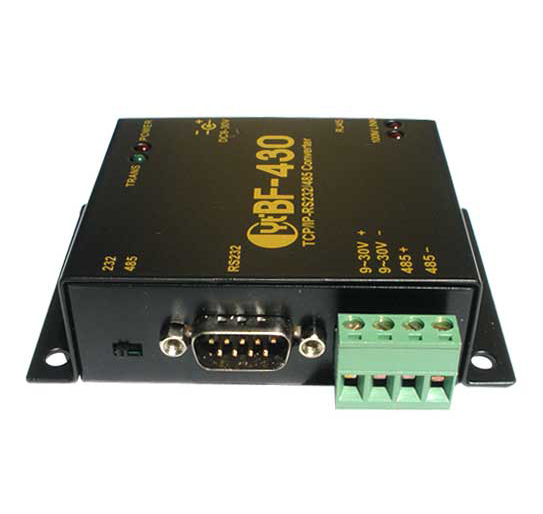 It is a very versatile unit which can be used with most standard serial RS232 and RS485 devices and equipment including industrial machinery, CNC machines, printers, control equipment PLC control and most other commercial and laboratory equipment with a standard serial port. For alternative serial to Ethernet solutions please see our selection of other serial to Ethernet converters.